Put the blinis on a baking tray and heat in the oven for 3 minutes. Leave to cool slightly. Mix the vodka and crème fraîche and season with 1 tbsp lemon juice and salt and pepper. Spread the crème fraîche mixture over the blinis. Cut each slice of salmon into 3 and drape a piece on top of each blini, squeeze over a little more lemon juice, season with black pepper and top with ½ tsp of the roe. Put on serving plates and drizzle, if you like, the lemon and basil oil around the outside of each. 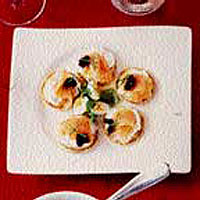 Add a tiny pile of leaves to each plate, top with a halved quail's egg and finish with a piece of chive, parsley or basil.